First, I want you to close your eyes and imagine a beautiful starlit night. Your significant other is sitting across from you, looking better than ever. And you thought you had seen their best moment. This one totally trumps it, hands down. You made extra preparations as well, and a hired mariachi band waits quietly in the corner to step out and make a big surprise when the time is right. You were smart, and asked mister Google "what are some mariachi bands near me?" Just when he or she least expects it, the band steps out and starts to gently serenade your night with timeless mariachi music. It really couldn't get any classier. Your significant other is absolutely amazed, eyes twinkling with surprise. Who would have guessed that an authentic Mexican band would be waiting in the corner? Their fancy mariachi outfits really set it off and mark the occasion as something extra special. And what if you want a mariachi restaurant kind of night? Well, luckily for you we have some deals worked out with local restaurants here in Houston so we can create this type of atmosphere for you. We sometimes have coupons as well to venues here in the area. 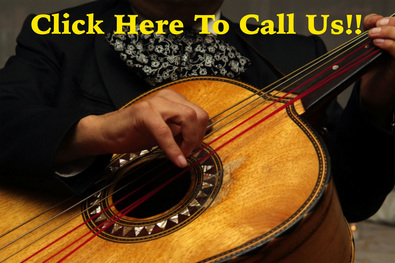 Do you want to dine in a fine Mexican restaurant with mariachi band? Mariachis En Houston can make that happen! Just give us a call at 832-681-0414 for your free quote today! The best thing about a Mexican mariachi band is that even though the music is upbeat, it's also soothing and doesn't interrupt your conversation. The gentle sounds of the mariachi guitar keep your blood pumping during the entire evening, so there are absolutely no dull moments. Just you and your amor. And by the way, it's also a great marriage proposal idea! Being serenaded by a band has to be one of the most romantic ways to propose ever, like in the whole history of mankind. If ever there was a creative proposal idea, it would have to be this one. Not only does it win a few points for being classy, you'll also be able to say you had a unique night! It's especially a good wedding proposal idea at home, and one sure to create a lively and fun situation with your sweetums. So whether you plan to have your proposal dinner at home or at your favorite restaurant, we'd love to be a part of it! Give us a call at 832-681-0414 for your free quote today! Let's create lasting memories together, what do you say? Just give us a call or leave your contact information at the other end of this form and we'll take care of the rest! Thank You For Visiting Mariachi En Houston! !